Swagbucks is a rewards program that gives you virtual currency that is redeemable for real life prizes. There are all kinds of different ways that you can accumulate rewards. Probably the easiest way to earn swagbucks( virtual currency) is just doing searches as if you were using Google. A lot of people like to ask,” Is Swagbucks legit or a scam?”. To clarify the question, yes, the rewards program is a legitimate program, but only has limited potential. The advantage is a lot of the activities you do to earn rewards; you do on a regular basis already. The currency that Swagbucks uses is essentially, equivalent to one penny. So 100 Swagbuck points equals one U.S. Dollar. Depending how you decide to cash out your rewards; Swagbuck points can actually become worth a little bit more. Here is a list, of a few, of the different ways you can earn rewards. In the same sense of using a credit card, when you shop on their website, you basically get cashback rewards just translated into their currency. As you can see looking at the picture above, if you were to shop for example, at Amazon.com, you would earn four Swagbucks for every dollar spent. A $100 dollar purchase would equal 400 Swagbucks in rewards (equals $4 dollars in U.S. money). If you are an avid online shopper, this is a great way to save a little bit of money on something you already do. Amazon Pays the company referrals allowing this to become possible to earn cashback. In a simple way, basically toss out Google, Bing, and Yahoo, and replace it with Swagbucks search engine to gain rewards. The great thing about this search engine is it’s powered by Yahoo. You are getting the same search results whether you use Yahoo or Swagbucks. The earnings are always at random. So, you will always get a different amount of points every time you search something. The best way to optimize your earnings is to add the SwagButton. Setting this as your default search engine, will allow you the peace of mind to earn swagbucks without thinking about it. You simply search the web and earn. Surveys are probably the best way to earn Swagbucks. It’s the fastest way, but also can be time consuming. Each survey you take has a different time length to complete, as well as, a different amount of points earned if completed. I always like being picky with the surveys I take ,because I want to earn a lot in a short period of time. Disadvantage is you take screening questionnaires to see if you qualify, and half the time you don’t. Probably the most exciting thing to earn rewards on. No, you won’t earn a ton of Swagbucks, but who doesn’t love watching videos? pretend it’s like another YouTube just a lot smaller in size. The disadvantage is you are limited to 150 Swagbucks a day for watching videos. But it is something you do naturally anyways. There are several different category’s you can choose from. These are the main ones to choose from. There are sub categories as well. I would say there is something for everybody to watch on here. You don’t become rich from watching videos, but at least you get some entertainment while you earn. Another entertaining feature to earn from. Beware, a lot of people get addicted to the games. The disappointing part is, a lot of the games, you have to spend money inside of to earn Swagbucks from. The good news is, there are games that you earn for just playing them. Of course, if you are like my mom, and spend money inside the games. You will at least get a little bit back. Some games can give you 12% back; which is pretty good if you buy a 100 dollar pack, you get 12 dollars back. For all those grocery shoppers out there. (and I know there’s a lot) This is bargain deal for you. Literally. So not only do you get Free coupons to use at your favorite places. You earn 10 Swagbucks for every coupon you redeem. That’s an extra 10 cents savings on top of what you saved with the coupon you just used. The great thing is there are coupons that allow you to save anywhere from 25-30 cents off, say dish soap, to getting a 25% off coupon to somewhere popular like Macy’s, a store you probably already go to. Swagbucks Rewards Store-What do I get? There are a variety of different rewards that can be redeemed with your swagbucks. You can use your points to enter sweepstakes for big money like a $1000 cash prize if you like the lottery. If you are just looking for some Christmas gifts, maybe spend the rewards on gift cards like Amazon or Walmart. Or maybe you already have enough money. Then you can use the points to donate to charities. Looking out for good deals on rewards because sometimes you can make your Swagbucks value to equate to a little more than a penny a point. So you always have to take the good with the bad in anything you do. So here is my list of the Pros and Cons of Swagbucks. So, Who Exactly is Swagbucks For? You could basically say everyone that uses a computer, and wants to earn rewards on daily activities that they already do on a regular basis. Though time consuming, many people actaully enjoy doing some of the activities on the website. For the most part everything is pretty much straight to the point. There is a little bit of video and tutorials to guide you through, but for the most part you don’t need any training to perform these tasks. No kind of software needs to be downloaded. If you are a mobile user, you should download the mobile app. Overall the program can be enjoyable. There are some issues that can be irritating, but not a terrible program to earn rewards from. Do be careful though for doing offers and handing out your email can become really spam-like in your emails. Swagbucks does not claim that you will gain huge earnings from them, and you shouldn’t expect it if you were to join them. It’s always great to earn a little bit of extra money on the side, but the income potential here is very limited. If you join the program with the mindset of what the reality is you will probably have a more enjoyable experience. Even if you only use the search engine, you will slowly but surely grow the amount of points in your account. Leave me a comment about your experience. Was it good? Was it Bad? I would love to hear feedback from you. If you have a question or advice leave a comment as well. Used to love the video section of this site – incredibly easy to earn a few swagbucks without actually doing something (well doing something else at the same time actually!). Excellent review. Swagbucks is a good distraction, but I’d never use it for more than a few minutes. The surveys can get really boring, and the fact that you can’t use Google really turned me off. Plus, it takes hour to get a few dollars. And their SwagButton is intrusive. I deleted it after only a day ’cause it wouldn’t stop redirecting me. Still, it is free, so who am I to complain? like you said, it is free. I don’t mess around with everything, but just using the search engine can rack up some dollars without any added effort. Swagbucks is a reliable and proven program to make some extra income by completing simple tasks. What I like most about Swagbucks is that it allows you to earn Swagbucks through different ways which make this program appealing to people. But it’s a good option only for making some extra income and it’s in no way can replace your regular income. 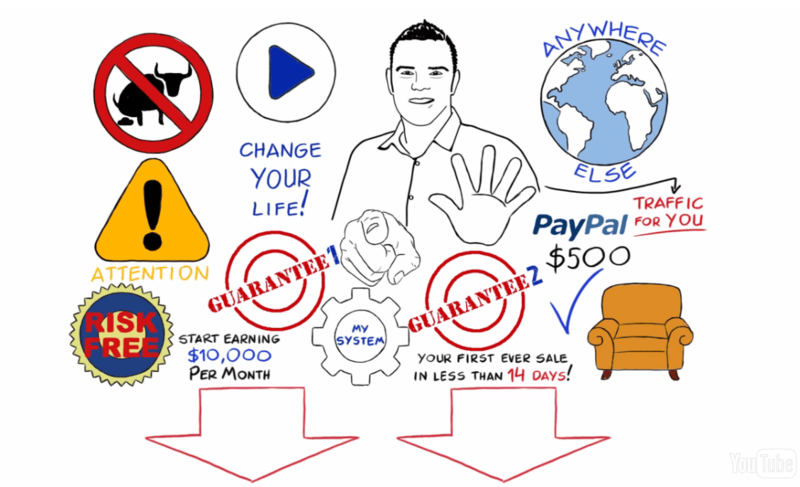 I think instead of buying into fake offers that guarantee you x amount of money and leave you completely disappointed it’s better to complete simple tasks and get paid guaranteed amount of money by Swagbucks. Yes you are correct, the system does work, and has for a lot of people. I would never do the CPA offers since, like you said, they leave you disappointed. 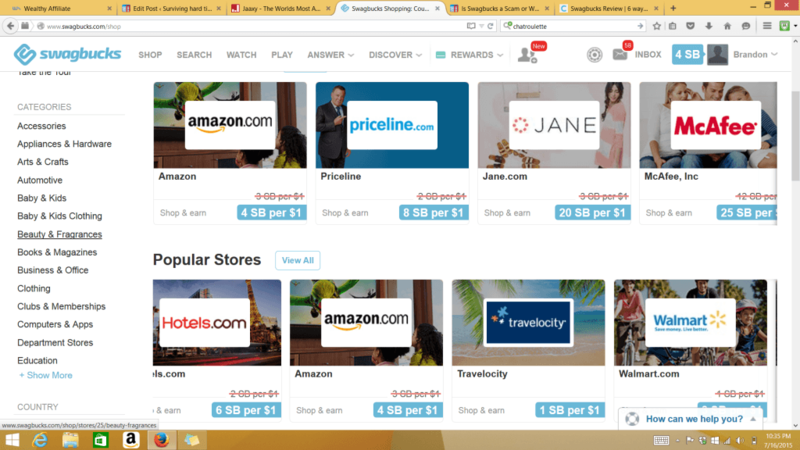 Swagbucks best feature is the search engine, in my opinion. It’s the easiest to do, and truly is something you can do without thinking about anything. Watching videos isn’t a bad offer either considering most of the videos I watch on Swagbucks will have some kind of interest to me. As a survey site, I don’t really find it worth it. Unless you enjoy taking surveys, it’s just to time consuming to get a quarter for a 30 minute survey. You are correct in the sense that Swagbucks is not worth the time for taking surveys. However, I do want to enlighten you on this topic. I have removed your affiliate link that you posted in my comment thread, but before I did, I checked out the Website you mentioned. Well, the first issue I have with this is your website doesn’t actually exist. Instead it goes to a Clickbank product that supposedly knows the secrets to making money with online surveys. Well, I already know the secret. It’s called gaining referrals. This is so other people take the surveys, instead of you, and you receive a small commission of the money people make. Secondly, ANY website that tells you to pay money before receiving these “high paying” surveys is a scam. All that happens, when you pay, is you receive a list of websites where you can get paid to take surveys. All the websites on the list are free to join, and can be easily found by searching for them with Google. I wouldn’t be surprised if Swagbucks was on that list of free survey taking websites. Even experts, that have been taking surveys for years, have stated that this is not a feasible way to make a full time income online. Also, why pay for a list of free survey sites? It doesn’t make sense to me. Recently I wrote an article called, “Earn Money With Online Surveys-Is It Worth It?” I recommend you check it out so you can understand more reasons to why Surveys aren’t always worth the time. Which means any Survey Website, not just the one you tried getting me to sign up for, and pay. I do, however, want to wish you luck. I hope you have much success with whatever journey you walk through. Thanks for such a detailed post. I had heard of Swagbucks but always thought it was probably just another MLM scam or similar, so I didn’t ever bother to look at it. It appears, like you say, that it is a legit program and actually is completely different to my thoughts – shows how you should always check things out first. I buy loads of things through Amazon and if it means just browsing them via Swagbucks and earning a little reward then it’s actually quite good value. Thanks for pointing this out! Don’t think I’ll be doing many of the surveys (I don’t ever seem to qualify lol) but some cash back on sites I already shop with and a few points for normal online browsing seems great to me. It’s important to always do your research. While Swagbucks won’t make you a millionaire, It does make you money in more legitimate ways than a lot of companies. The cool thing is searching with them; you are still powered through Yahoo, one of the more powerful search engines. Surveys aren’t my high recommendation for this program, but some people do take them for the fun of it. If you were that type of person you could always do it, though I know you said you are going to avoid the surveys. Anyways, I’m glad you found this review helpful. Good luck on making a few dollars here and there, and hopefully I’ll see you around later on my website.